Day 4 of the Sierra Challenge saw us in familiar territory, the South Lake TH for a hike over Bishop Pass. We've used this route on half a dozen past Challenges, this time to reach an officially unnamed summit overlooking the southern end of Dusy Basin. It's not the closest peak to Knapsack Pass, but it seemed "close enough" when I was looking for something to call it. There were 25 of us for out of South Lake, a record number for a Monday. Seems there are more and more folks taking vacation days to participate in the sufferfest. It was a beautiful morning with clear, cloud and smoke-free skies. It was a speedy and determined group that led the charge out in front and I had much trouble keeping the pace. There were several shortcuts to be found, utilizing the older, steeper and shorter cuts through the forest before the trail was "tamed". I reached Long Lake after about 40min, finding the still waters ideal for photographing Mt. Goode and Hurd Peak through its reflection. Our splintered group was stretched out over a good distance now as we headed towards Bishop Pass. I kept three of four folks in view for most of the ascent to the pass, but because of the shortcut I had no real idea how many were behind or ahead of me. We had been told of the "deer pile" to be found just north of Bishop Pass. A large herd of some 76 mule deer had slid to their deaths in treacherously icy conditions the previous November. Bears, coyotes, birds and other scavangers had feasted on the remains before and after the winter snows had covered them, reducing the carcasses to mostly hides and bone by summer. The pile was not hard to spot as it lies immediately uphill of the trail as it switchbacks up to the pass, flies and a strong smell giving away its location even before it is seen. I reached Bishop Pass around 7:50a behind Mason and at least four others that were gathering at the pass. We could see our peak to the south across Dusy Basin, sandwiched between Columbine on the left and Giraud to the right. I had hoped to reach the peak via the north side of a saddle to the peak's west, but this looked like it might have difficult cliffs. The alternative was to first climb the lower Pt. 12,265ft to the northwest, the same route used to reach Giraud. More folks came over Bishop Pass as we headed down the trail into Dusy Basin. JD and another participant took a cross-country shortcut to get ahead of a few of us, saving a minute or two. We followed the trail for about two miles, until it turns west to drop down into LeConte Canyon and the Middle Fork of the Kings River. Here we left it to head cross-country to the south, down a series of granite benches to the unnamed lakes in the lowest part of Dusy Basin. The stream crossing here took a moderate effort to find a safe way across, our group splintering further. Once across the creek the climbing begins in earnest. Having decided the original route plan looked implausible, I turned my attention to Pt. 12,265ft. I was angling to the left (east), hoping for a more direct route up to the intermediate point, while most of the others were taking routes further to the right. As I neared the NW ridgeline, the granite slope grew cliffier, causing me to slow some as I struggled over one large granite shelf or another. Kristine appeared briefly above me, waved, and continued on her way. By the time I reached the ridge, most of the others were well in front. I would periodically spy one or the other ahead of me, but most of the time it was just their bootprints in the sand between boulders that I was following. The better route would have been to move to the southwest side of the ridge and follow the cirque up to a saddle with Giraud. Instead, most of us followed closer to ridge, just below on the southwest side, weaving through stunted trees and large granite blocks. Most of us went over the south shoulder of Pt. 12,265ft above the saddle, then aiming ESE for our peak still almost half a mile away. Clement went over the top of the intermediate point, but reported finding no register there. There was much granite to negotiate, in boulder, talus and sand form, and it would be 10:20a before I finally found my way to the top of Knapsack Pass Peak. There were four folks already there, snacking and enjoying the fine views to be had from the summit. Interestingly, neither of the Yellow Jersey contenders were among them. Zach and Rob had been cajoled by Kristine to join her for a visit to the higher Giraud Peak first. I doubt that one would have gone with her if the other declined, but since they were both safely well ahead of the next closest competitor, it was a pretty safe move to go after the bonus peak. Having already been to Giraud, I was more interested in unnamed Peak 12,112ft, less than a mile to the south. There was no register to be found at the summit, a bit surprising, and I had neglected to bring a spare one with me. This visit would go unrecorded, at least at the summit. 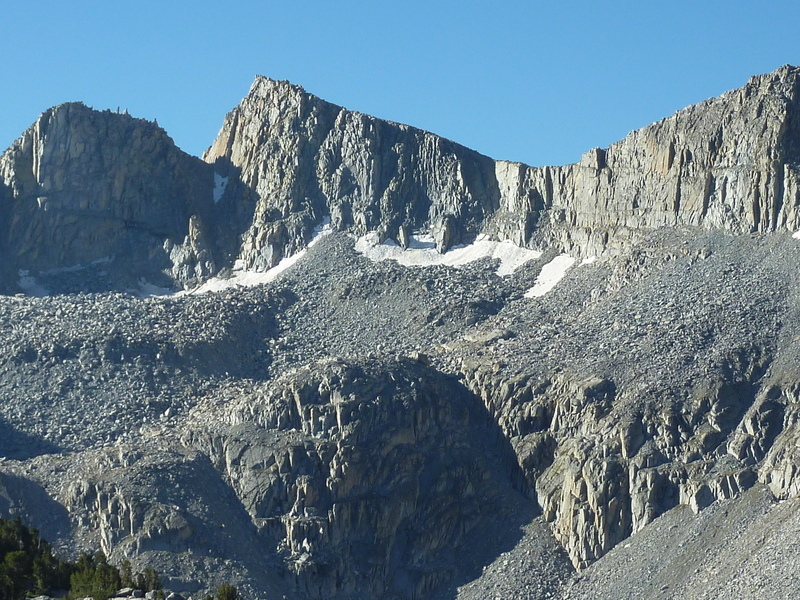 Views stretch across Dusy Basin and Palisade Basin to the massive wall of the Sierra Crest anchored by a host of the state's 14ers. To the west rises the Black Divide while to the southeast stretches an endless array of Sierra peaks and canyons as far as the eye can see. I stayed atop Knapsack Pass Peak only a few minutes before starting for the second peak. I had tried to talk the others into joining me, but only Clement showed any interest before it was time to leave. A rough ridgeline connects the two peaks, dropping nearly 400ft to a saddle between them. There is an intemediate, class 5 pinnacle before reaching the saddle that needs to be bypassed. While I took the easy way down a scree chute to the southeast, Clement took the harder scrambling route around to the west. Some traversing to the south at the bottom of the chute got me nicely back to the saddle between the two summits, but it was some minutes before I was able to ascertain that Clement was still behind me. As he was obviously a faster scrambler than myself, it showed that my route was indeed the easier choice. The climb from the saddle up to Peak 12,112ft was an enjoyable scramble, the best climbing of the day, I thought. Staying on the North Ridge directly is somewhat difficult, but there are nice options on both the east and west sides that work well. Clement caught up and reached the edgy summit block at nearly the same time as myself. The summit is perched high above Palisade Creek and the Pacific Crest Trail, some 3,700ft below to the south. Across the canyon rises Observation Peak and a host of other high summits across a vast stretch of the middle of the High Sierra. This summit, too, sported no register and for the second time in the last hour, I was regretting having forgotten to bring some of my own. We descended back down the North Ridge, taking slightly differing lines, meeting back up again at the saddle below. From there we parted ways as I headed back over the original saddle between Giraud and Pt. 12,265ft, Clement heading to Giraud's summit. It was a pleasant hike through the small basin east of Giraud, passing by a picturesque unnamed lake along the way. On the other side of that first saddle I discovered the easier return route into Dusy Basin, avoiding the NW Ridge of Pt. 12,265ft until it was time to cross over it. I hadn't seen anyone for most of the last hour when I came across Scott making his way in the opposite direction. He had first climbed Mt. Goode and a few other summits before dropping into Dusy Basin. He was tired but in good spirits, despite the lateness of the day. He probably wouldn't get to Knapsack Pass Peak until 2p and he was still hoping to get the other two bonus peaks nearby (he would decide to skip Giraud, but made it to Peak 12,112ft). On the way down into Dusy Basin, I caught sight of a small posse working their way back over the creek at the bottom. I eventually caught up with them after I'd reached the trail, find Alberto, Matt and his sister, Cheryl. We continued as a group up the trail towards Bishop Pass for another mile or so before I pulled away and dropped back down the other side of the pass on my own. I plied the busy trail for an hour by myself, passing by various backpacking parties going in one direction or the other. There was a trail crew working in the vicinity of the deer pile, fixing damage from the inevitable rock slides that occur on the trail every few years. Zach caught up to me as I was reaching Long Lake, slowing to a jog to hike with me for a while. We passed by an odd sight - a bikini-clad paddleboarder at the north end of the lake taking one selfie after another while we walked by. Later we would see her exit the TH with the inflatable paddleboard strapped to her back, though no longer in her bikini. Just before 4p, Rob caught up with us, catching Zach by surprise. He'd thought he'd left Rob miles back in the cross-country section, but once on the trail Rob had speedily caught up. He got Zach to take up running once again, and the two of them left me in the dust to finish together. We weren't far from the trailhead at this point and I would finish only five minutes behind them. I managed to catch up to Tom Becht just before the end, the two of us finishing with a time of 10h20m. Back in the parking lot, we found others gathered around Rob's van in the shade, sharing drinks that my brother Jim had brought for us. I spent nearly an hour swapping stories with the others before heading down to Bishop for the night. AJ took the stage win, beating everyone else by at least 45min. Finishing with Rob, Zach kept his 25min lead over his rival for the Yellow Jersey while Rob was comfortably hours ahead for the Green Jersey (over 50yrs). Scott would finish the day with another five peaks, giving him a commanding lead for the King of Mountain Jersey with a towering 23 peaks after only 4 days.